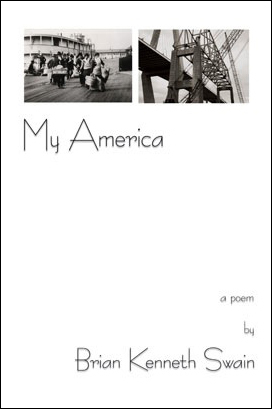 My America is a poem that examines the full range of human experience and emotion in the context of everyday places and images. From urban to rural, from the coasts to the plains, the stories are of ordinary people, their loves, their fears, and their dreams. It is “Winesburg, Ohio,” “Leaves of Grass” and “On the Road”, rolled up in one audacious and unforgettable journey. The project came about in 2005. As Hurricane Rita approached Houston, Texas, residents were ordered to evacuate. I spent a week driving across the southeast, and, having no particular destination, took the opportunity to visit many small towns one would normally never encounter if one stuck to the major highways. From each town that I visited I came away with stories and observations that leant themselves nicely to the compact descriptive images that populate the poem. When I got home a week later, I was happy to discover not only that Rita had spared Houston entirely, but that I had about twenty stanzas of the poem that would become My America once I had developed additional images and stories from around the rest of the country. Having visited every state in the country at one time or another, it proved an enlightening and energizing exercise to imagine what extending that southeastern drive would have been like had I done it from one end of America to the other. Every state is represented in the poem, and the quotes that begin each section are from writers who were born in each particular area of the country, including a few that run counter to common knowledge, Robert Frost for example having been born in California, though he is widely associated with New England,. The project was great fun and I strongly suspect this will not be the final edition of My America.